Winner of Six Australian Academy Awards, Including Best Picture and Best Director. This is the film that became a worldwide sensation and remains perhaps the most beloved and acclaimed romantic epic of all time. Oscar -nominee Judy Davis (Passage To India, Husbands and Wives) made her international debut as Sybylla Melvyn, a free spirited young writer who refues to conform to society's expectations of how a 'proper woman' should live her life. Sam Neill (Jurassic Park, The Piano) co-stars as the wealthy suitor who tries to win her restless heart in this Oscar nominated classic by Gillian Armstrong (Little Women, Starstruck). Long unavailable in America, My Brilliant Career has been fully restored and remastered in High Definition from the original negative, under the supervision of Academy Award nominated Director of Photography Donald McAlpine. The acclaimed debut of Judy Davis is the best reason to see My Brilliant Career, and the award-winning film is highly recommended as the feature debut of director Gillian Armstrong. This was an early entry in the magnificent "New Australian Cinema" movement that yielded such classics as Picnic at Hanging Rock, Gallipoli, and Breaker Morant, and 27-year-old Armstrong (who would later direct the popular 1994 version of Little Women) brought just the right feminist touch to this stately adaptation of the 1901 semi-autobiographical novel by Miles Franklin. 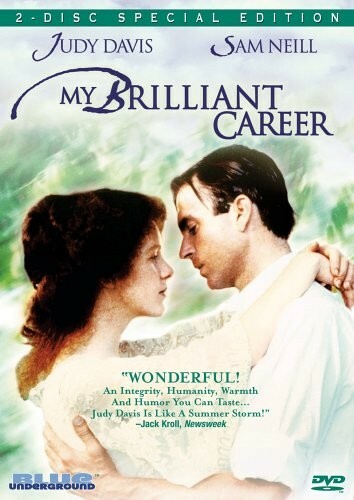 Davis (who was 23 at the time) plays 16-year-old Sybylla Melvyn, on the verge of womanhood in turn-of-the-century Australia and determined to have a "brilliant career" as an independent writer and lover of life, but her attraction to a wealthy bachelor (Sam Neill, charming as always), and the pressures of her family to lead a conventional life of devoted domesticity, turn this into a romantic and highly observant drama of personal dilemma and free-spirited conviction.